Welcome to the 2018-19 edition of the Young Bucks Tracker. 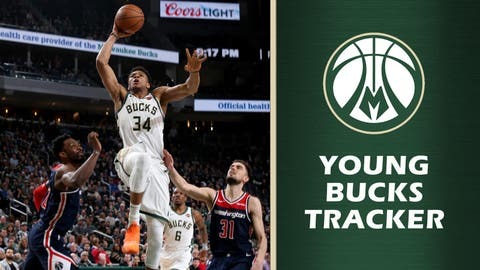 Each Thursday we’ll either track the progress of the players who might be of help to the Bucks in the future from the Wisconsin Herd or a current member of the Milwaukee roster. We’ll also give updates on the other young players from the previous week. This is the 22st and final edition of the 2018-19 Young Bucks Tracker. This season, Antetokounmpo went from being Milwaukee’s most valuable player to the NBA’s most valuable player. Playing in 72 games, Antetokounmpo set several career highs, including points (27.7 per game), rebounds (12.5), assists (5.9) and field-goal percentage (57.8%), all this despite averaging 32.8 minutes, nearly four fewer minutes than last season and his lowest since his second season in the NBA. For the third consecutive season he had 1,800+ points, 700+ rebounds and 300+ assists — only Larry Bird and Oscar Robertson have longer streaks, each doing it four straight years. Antetokounmpo had 31 games in which he scored 30+ points, the most by a Bucks player since Kareem Abdul-Jabbar had 34 in 1973-74 (no other Milwaukee player has had 30 such games in a season). Only Houston’s James Harden (52) and Oklahoma City’s Paul George (32) had more 30-point games this season. He became the first Milwaukee player to post at least 30 points, 10 rebounds, three assists, three blocks and three steals in a game since Terry Cummings in 1986 when he recorded 34-14-3-3-3 in a Jan. 25 win over Charlotte. Antetokounmpo also had nine games in which he had at least 30 points, 15 rebounds and five assists. No player in the NBA since 1977-78 has had more than six in a season and the only players with more than nine in league history are Abdul-Jabbar, Elgin Baylor, Wilt Chamberlain and Oscar Robertson. Giannis’ name is littered all over the NBA leaderboard. First in player efficiency rating (30.9; the first Bucks player to top a 30 PER; Abdul-Jabbar had a 29.9 PER in 1971-72), first in win shares per 48 minutes (.292), second in defensive rating (99.4; only one of two players under 100, Miami’s Hassan Whiteside (99.1) being the other), second in box plus/minus (10.8), third in points per game, third in win shares (14.4), third in offensive win shares (8.9), third in defensive win shares (5.5), fifth in usage percentage (32.3%), sixth in rebounds per game, seventh in true shooting percentage (64.4%), seventh in defensive rebounding percentage (30.0%), ninth in effective field-goal percentage (59.9%), 10th in blocks per game (1.5), 11th in field-goal percentage, 17th in offensive rating (121.2; side note: James Harden isn’t in the top 20), 19th in assist percentage (30.3%) and 19th in block percentage (3.9%). Phew. That’s why Antetokounmpo is the MVP. And we don’t mean “Milwaukee” for the M.
— Eric Bledsoe shot a career-best 48.4% from the field in 2018-19, buoyed by making 58.2% of his 2-point attempts, which was also a career high. — An injury shortened Malcolm Brogdon‘s season, but he still qualified to lead the NBA in free-throw percentage (92.8%). He also was 19th in effective field-goal percentage (57.5%) and 20th in offensive rating (120.7). Brogdon also finished with the rare 50-40-90 season — 50.5 FG%, 42.6 3FG% and 92.8 FT%. — In the final 10 games of the season, which included seven starts, Sterling Brown averaged 26.5 minutes, 12.0 points and 5.0 rebounds. Brown, the team’s second-round pick two years ago, averaged 6.4 points in 58 games. — Another player who stepped up late in the year was Pat Connaughton. He averaged 27.0 minutes over 21 games in March and April, shooting 51.8% from the field and 40.3% from 3 while recording 89 points and 6.0 rebounds per game. Overall on the season, Connaughton averaged 20.7 minutes. 6.7 points and 4.2 rebounds while shooting 46.6% from the field and 33.0% from 3. — First-round pick Donte DiVincenzo played in just 27 games, mainly due to injuries, averaging 15.2 minutes and 4.9 points. His 68.3 2-point field-goal percentage led all Milwaukee players. — Khris Middleton set career highs in 3-point makes (179 and 2.3 per game), rebounds (6.0 per game) and assists (4.3). While his scoring average was down from last year, Middleton’s per-36 minute scoring average was actually up (from 19.9 to a career-best 21.2) as he averaged 5.3 fewer minutes per games this season. Always known as a good two-way player, Middleton was 19th in the NBA in defensive win shares (3.6). However, his 83.7 free-throw percentage was a career low, although that’s a rate most players would be more than happy to have. — This year’s breakout player had to be D.J. Wilson. After playing just 71 minutes total as a rookie, the former first-round pick appeared in 48 games, averaging 18.4 minutes, 5.8 points and 4.6 rebounds. He finished the season by averaging 9.8 points and 8.4 rebounds in five April games, including posting 18 points, 17 rebounds and four assists (the latter two being career highs) in the regular-season finale.